Pergolas are an effective way to add shade and create ambience in your garden increasing the time you spend outdoors. Thinking about enhancing your outdoor space by building a pergola? Adding shelter to your garden is a great way expand your living space. When it’s unbearably hot outside, shade becomes paramount. Likewise, when it’s raining, without cover sitting outdoors is unappealing. But pergolas are more than just a way to protect from the elements. Paying attention to what’s above can help you define the space and enhance the atmosphere. It can also help create privacy from the peering eyes of your neighbours in spaces such as your outdoor entertaining area or pool. Pergolas come in various materials, sizes, forms and can be closed or semi-closed depending on your requirements and the space. Here we look at some of the most popular types of pergolas and coverings, and their pros and cons. 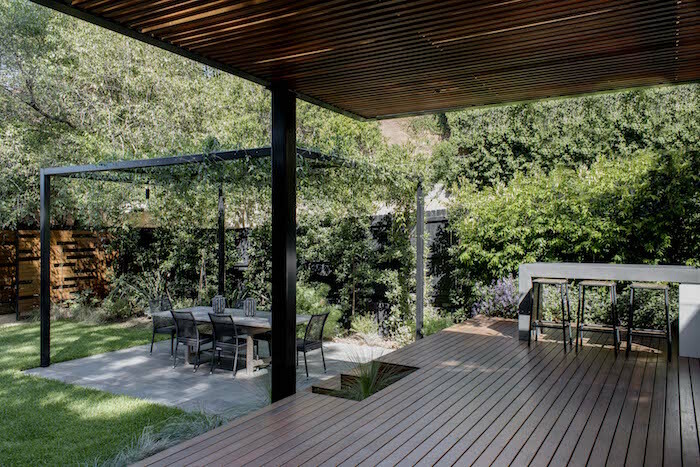 Timber is a material classic option for a pergola. The natural finish blends well with the soft landscape and can work with either contemporary or traditional-style architecture. Timber can be treated to have a natural look or painted to suit your home’s colour palette. As timber is readily available and straightforward to work with, it is one of the more affordable material options for a pergola. One of the main disadvantages of a timer pergola is that it may require more maintenance of repainting or staining and it can be exposed to heat damage and mould. Steel pergolas can be custom made and formed into a variety of shapes depending on the individual design specifications and left open to be clad with creepers or fully covered. One of the benefits of a steel pergola is that it is built to last and more durable than timber. Steel frames can also be powder coated or painted to your desired finish. However, the strength and durability does come with a higher price tag. 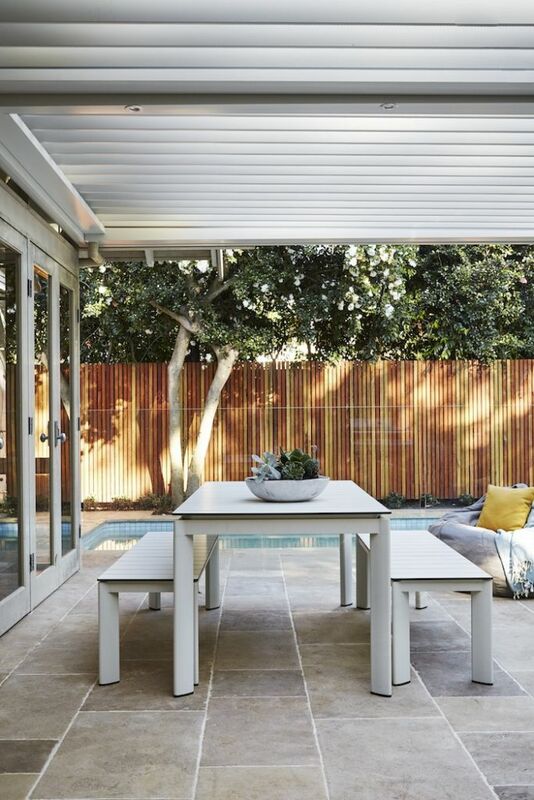 Beyond costs, one of the cons of a steel frame pergola is that it can be prone to rust and corrosion if not treated with a 100% zinc coating upon installation. Aluminium is another popular choice of pergola as it’s lightweight and has a low-maintenance finish. Due to its durable nature, aluminium pergolas are well suited to coastal locations. Being lightweight, aluminium pergolas may be more favourable in areas such as decks where weight needs to be kept to a minimum. Aluminium pergolas can be custom made or available in pre-fab kits which can be DIY installed. One of the drawbacks of a such a lightweight frame is that aluminium pergolas are prone to twisting or blowing over when subjected to strong winds. 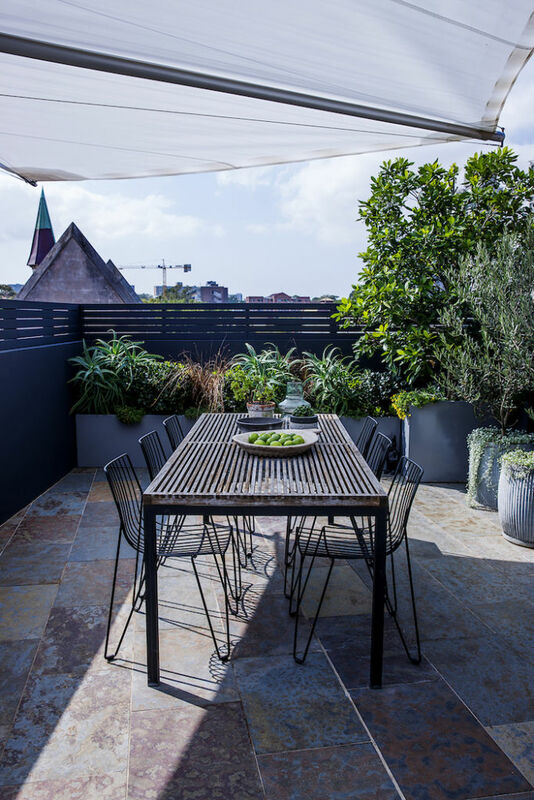 Be inspired by these outdoor spaces ideal for summer entertaining. 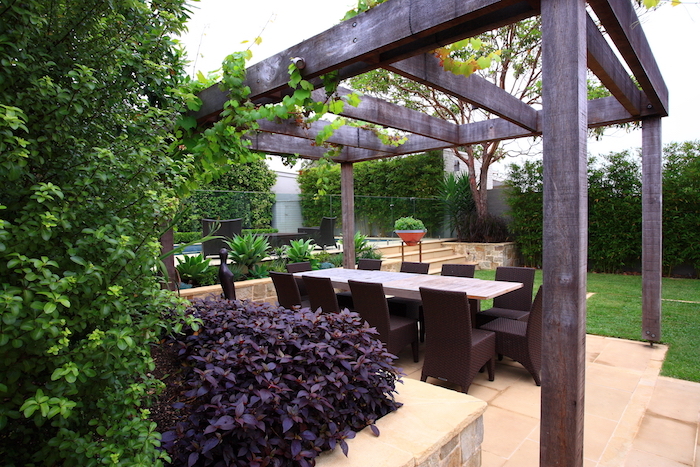 A popular way to cover a timber or metal pergola is through climbing plants. Using wires, flowering or fruit creepers can create a natural, draping shade over the top of the pergola adding to the ambience of the space. 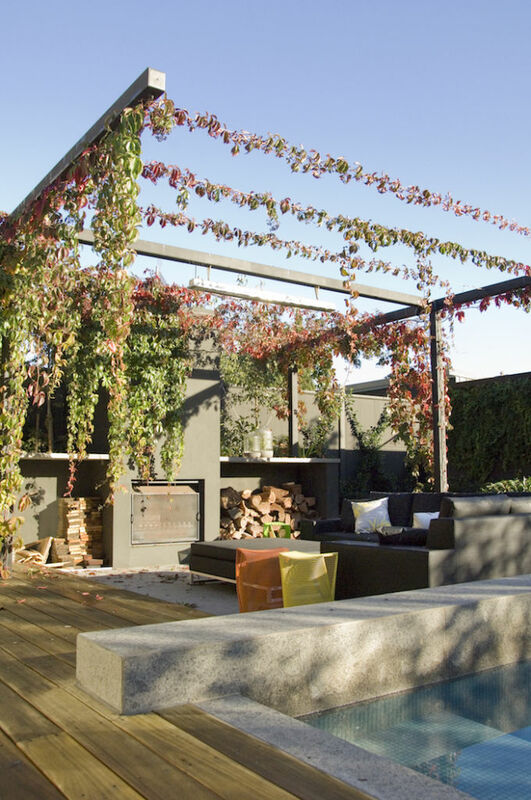 A creeper clad pergola can help integrate the pergola structure with the landscape and soften its appearance. A deciduous climbing plant also offers the flexibility of providing shade in the summer and letting the light into the space during the winter. One negative of a living pergola is that it’s not necessarily going to provide complete rain cover. 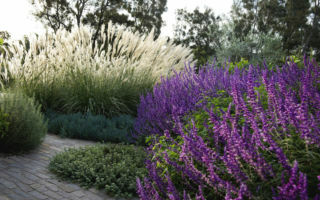 And while the plants can provide flowers and fragrance, the training required and leaf litter may not be appealing to some. Where full coverage is not required, timber battens can be an effective shading and privacy solution. Made from the same timber as the structure, the battens can be stained for a natural look or painted to suit the colours of the architecture. The battens can be arranged close together for full shade or spread further apart for greater dappled light. 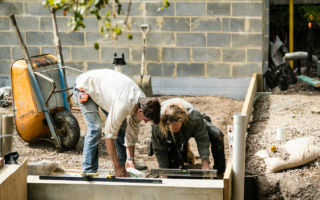 Wires can be placed along the battens for greenery or the timber can be attached to the underside of corrugated sheeting to improve the appearance of the solid cover. Corrugated sheeting is an option for those looking for complete shade and rain cover. The corrugated sheeting can be made of metal or polycarbonate in a solid colour, translucent or transparent to allow some light in. One of the main reasons people opt for corrugated sheeting is that it is affordable and typically easy to install. However, the translucent sheeting tends to be less durable than metal as well as difficult to clean. Aluminium louvres are a contemporary system that allows you to control the weather the ceiling is open or closed. They’re available in a variety of finishes and is a relatively lightweight structure. Choose from a hand-operated system or electronically controlled. A fixed louvre option is also available, but this is less flexible. The main advantage of aluminium louvres is the ease of use allowing for ventilation, shade and cover from the rain. This is one of the more expensive pergola options and tends to suit modern homes better than traditional architecture. Awnings and sales are a flexible and lightweight solution for those gardens where louvres or a solid covering is not an option. They’re available in a variety of waterproof fabrics and can be custom made to suit any sized pergola. 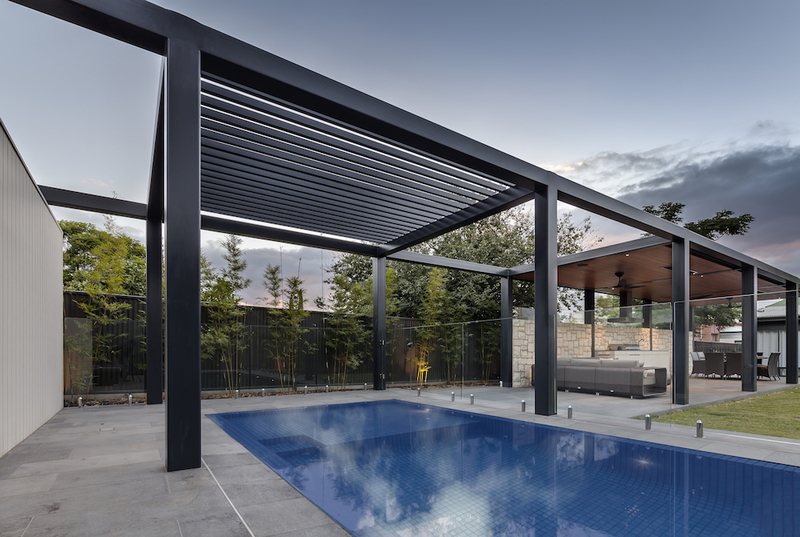 While these are a cost-effective shade option, awnings and sales are not overly durable and can be prone to damage when subjected to high winds or heavy rainfall. Over time, awnings can succumb to mould and stains thanks to leaf litter and dirt. 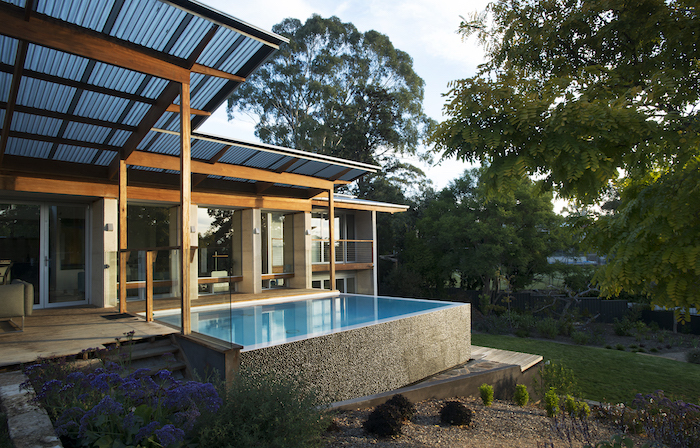 Feature image: Metal pergola spanning the pool by Glasshouse Projects.